Augmented Reality interface for the Microsoft Hololens. Created by Barak Chamo, Maï Iszak and Gabriel Brasil during the MIT Reality Virtually Hackathon - October 2017. "Toys that make Noise" was developed by combining Vuforia's Augmented Reality platform with the Hololens - Microsoft "self-contained, holographic computer" - to bring personal objects and memories to life. In the real world we surround ourselves with things that have meaning and are attached with personal memories: Pictures in frames, little souvenirs, gifts and one of a kind objects. But in our increasingly digital lives, all of our dearest memories are just files in folders like any other. With "Toys that make wow" we use Augmented Reality to connect both our physical cherished mementos, with our digital memories. Just need to stare at a picture on a frame, and a video of that event is played; look at a hand drawn illustration and 3D objects appear. Physical objects can also talk to one another. In our experience, each souvenir played part of a music that is played as whole when all objects were activated by staring at them in order. 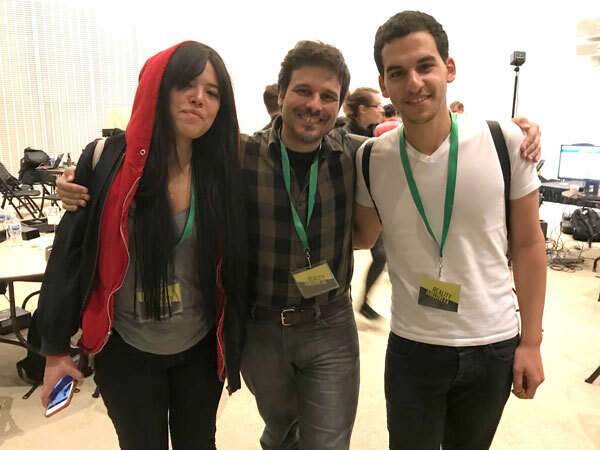 Team behind "Toys that make Noise": Maï Iszak, Gabriel Brasil and Barack Chamo.